Ralph McTell once invited us to take his hand and be led through the streets of London so that’s exactly what we’ll do with this UK-themed online slot from Aristocrat Leisure. It’s all based around the capital city and not only does it include various iconic symbols, it also contains two separate bonus features and a an opportunity to gamble any wins. 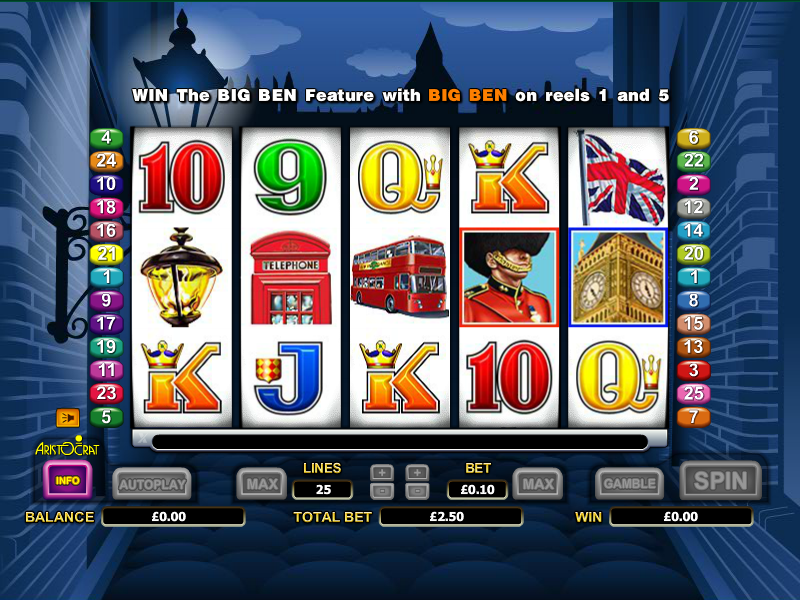 Big Ben is a five reel slot with three rows and up to twenty five paylines; the backdrop to those reels is a a rather gloomy London street lit by a solitary lamp. The reel layout will be familiar to any players used to Aristocrat games. A selection of London icons make up the high value symbols – a gas lamp, a telephone box, a London bus, a pub sign, the Union Flag and the royal crown; 9, 10, J, Q and K represent the lower values. The Beefeater guard is wild and worth a massive 30000x your line stake for five on an active payline; he also double any other wins to which he contributes. Big Ben is the scatter symbol and the key to both features. 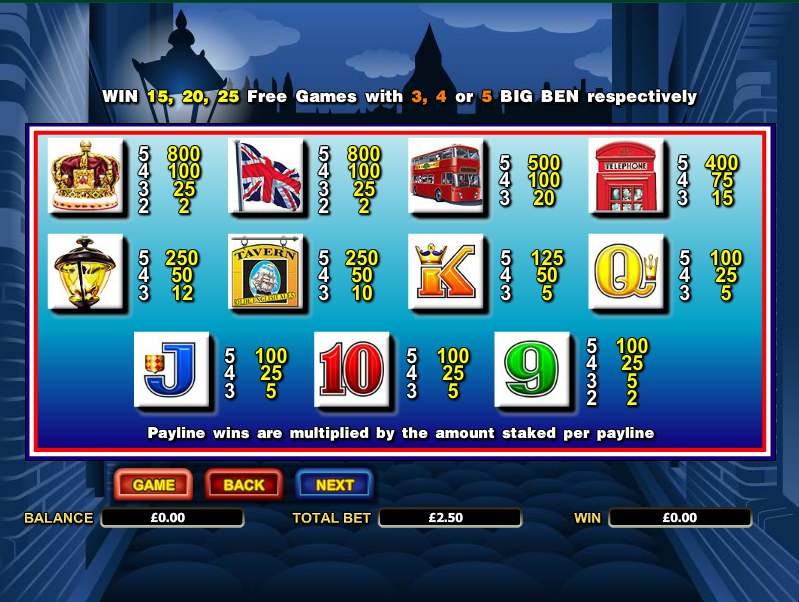 All wins during this round are doubled and it’s also possible to trigger more spins by landing three or more Big Ben symbols once more. This mini-game is triggered by landing the Big Ben scatters anywhere on reels one and five; it’s an interesting bonus and Big Ben will start to chime. The more chimes you hear, the greater the multiplier (of your win) you are awarded. The maximum is 500x as you can see from the chart below. Any win can be gambled by clicking the ‘Gamble’ button below the reels. Try and double or quadruple that amount by guessing the correct colour or suit of the next card drawn. You can guess correctly up to five times. Big Ben is quite good fun but it could have done with some London-themed music rather than the standard electronic noises and bleeps. However, several bonus features make it worth a go and it has an RTP of 95.54%.